We go from freezing arctic Brrrrrr - "baby it's cold outside" weather to, hey "it's a heat wave". One extreme to another within hours! Okay, a relief from the bitter cold is nice, but does it have to be to that extreme???? I want to share an event that took place at Fibre Junction, back in early December. It was our last meeting of Jo's Little women' club 12. Both the day and night group met in the evening. It was a "potluck" dinner, gosh was it delicious! 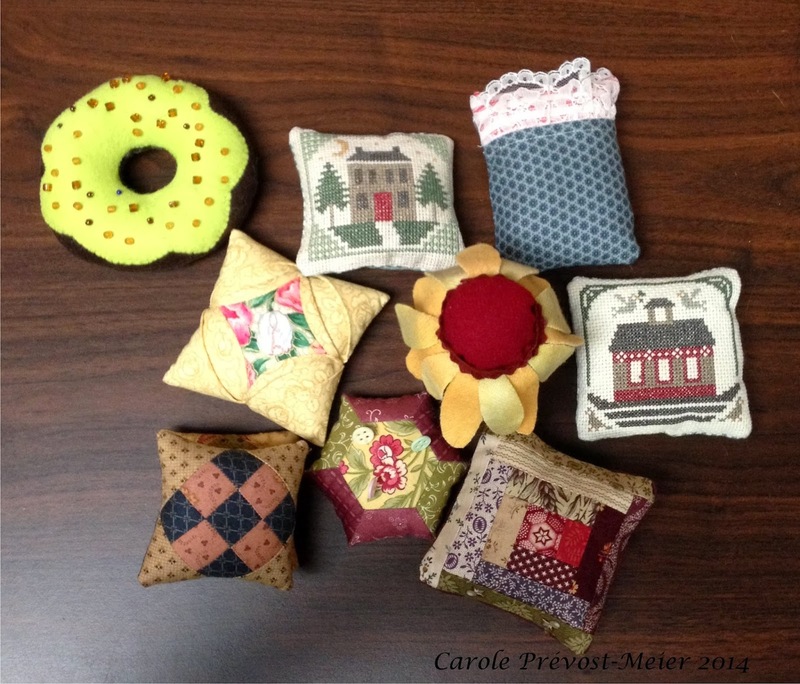 And those willing, brought a hand made pin cushion gift wrapped for our "Yankee Pincushion Swap". What a blast it was! There will be 3 rounds. Each participant picks a number out of a hat. We proceed in numerical order. Everyone gets to open a package on the first round. When your number comes up, you chose a wrapped package from the pile, opened it, and if you want to swap, you can do so with other members who have opened a gift. Round 2, everyone has a change to swap - numerical order. On round 3, only number 1 gets to swap. Here is the last one. I just couldn't get a picture of the whole thing. I truly enjoyed everyone's creativity. Each one is so unique. I just love them all! What a great group of women! This is the pincushion that came home with me! 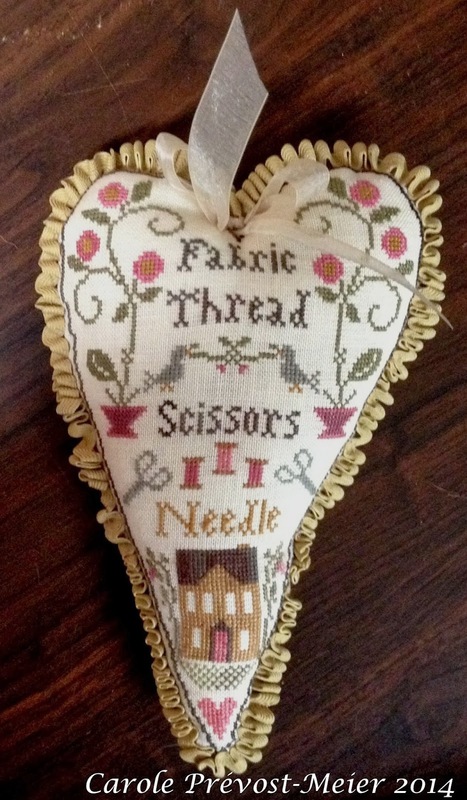 Cute as a button and it fits nicely in my English Paper Piecing basket. What a great group of women! Thank you! Thanks for stopping by my little corner of cyber space. Cheers! Do you participate in swaps? I sure do, and I love it. This year, I did Donna - Chookyblues Secret Santa swap! Kerry Swain was my Secret Santa and sent me a copy of her book. Love the projects in it! She also made this beautiful wall hanging. Thank you again Kerry for being my Secret Santa and thank you Donna for hosting another successful swap!